Parents can certainly assist the IEP team with developing goals. One IEP area that I find parents and teachers struggle is to address the skill of writing. And by writing, I’m talking about content, not handwriting. If your child struggles with the actual task of handwriting, I would read this post on dysgraphia or ask for an OT evaluation. For the purpose of this post, the IEP goals will focus on writing as far as content, fluency, and expression. 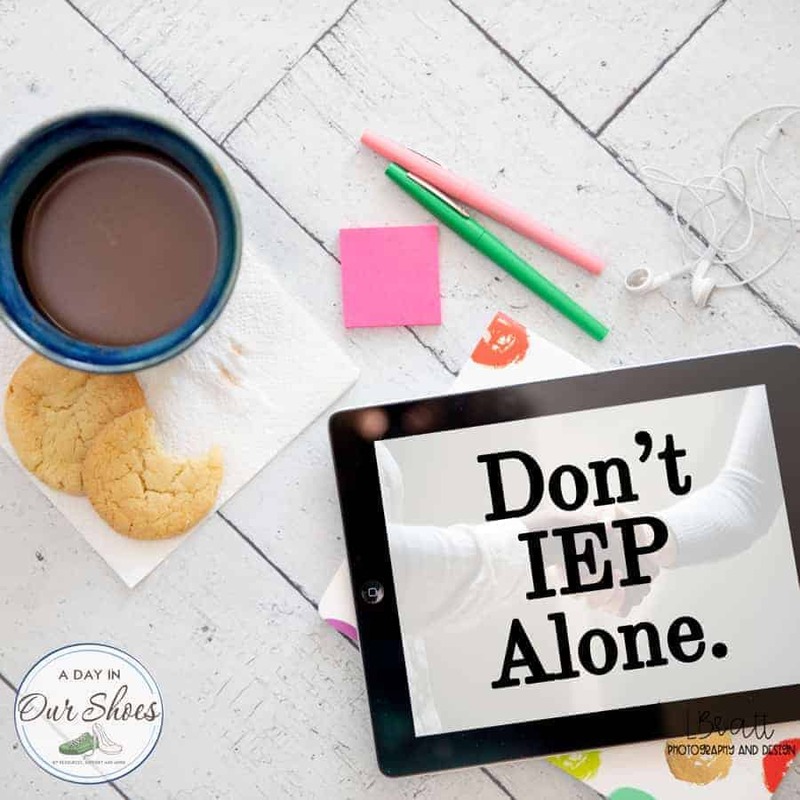 I have a large IEP Goal Bank that lists and links out to literally thousands of IEP goals. So if you cannot find what you are looking for here, I suggest you check there. What’s great about many IEP goals is that you can change the details of the IEP goal to suit any age, grade or ability. 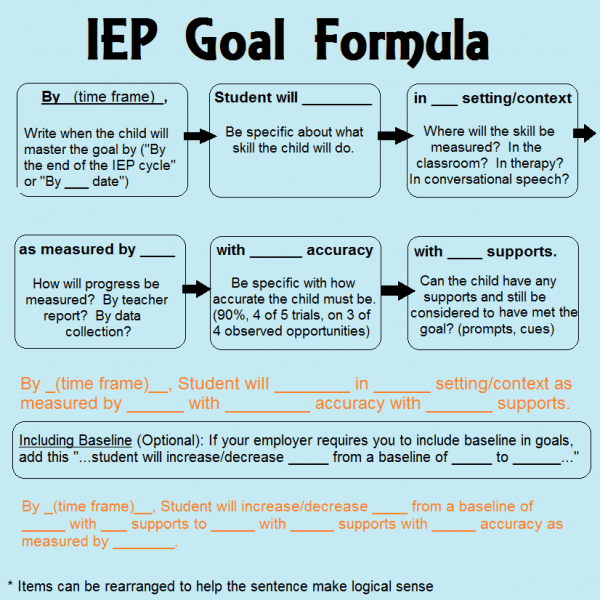 I have a graphic below detailing how to make an IEP goal measurable. When given a writing assignment, [student] will independently create a keyword outline. He will have a main topic and [number of] supporting points as a basis for the essay. [student] will use the keyword outline process to create a written composition which contains [number of] paragraphs of at least [number of] sentences each, an introduction, conclusion. [student] will include at least [number of] supporting points in [number of] separate paragraphs. [student] will demonstrate this ability in all content areas and all settings. [student] will independently develop his ideas for assigned essays. [student] will create five-paragraph essays with proper essay structure using [name of] software to dictate ideas to the computer. [student] will demonstrate the ability to use [name of] software to dictate essays in all class subjects. [student] will write and edit a five-sentence paragraph that addresses a given subject in the general curriculum. Each paragraph will include a topic sentence, at least [number of] details and a conclusion. [student] will earn a score of [desired score goal] or higher on a writing rubric for each writing assignment. There will be at least four writing assignments per quarter. For each essay assignment, [student] will independently develop his ideas fully. [student] will write passages that contain well developed main ideas. [student] will give at least [number of] details in each paragraph. [student] will demonstrate this ability in all content areas and all settings for all essay assignments in the general curriculum. When given writing assignments in the general curriculum, [student] will edit his writing for spelling, punctuation, and grammar. [student] will have fewer than [number of] overlooked errors per [number of] words, without assistance. [student] will demonstrate this ability across all settings. Please also check out this awesome list of IEP Writing Goals from the Learning Support Toolbox. He is a special ed teacher who not only has a comprehensive list of goals but has matched them up to the Common Core Standards. You can also add in phrases such as “working independently” to further define the goal. « I asked for an IEP and was offered a 504/RTI instead.